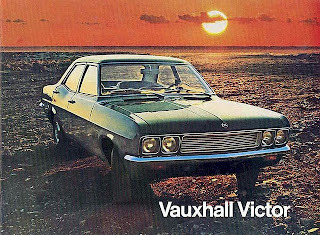 Vauxhall’s Victor was all-new in 1968 and now rode on a longer 2 590-millimetre (102-inch) wheelbase. Front track was nine centimetres, (three inches) wider than before. General Motors of Canada Limited began importing the Vauxhall line of cars from its British subsidiary for the 1948 selling season. 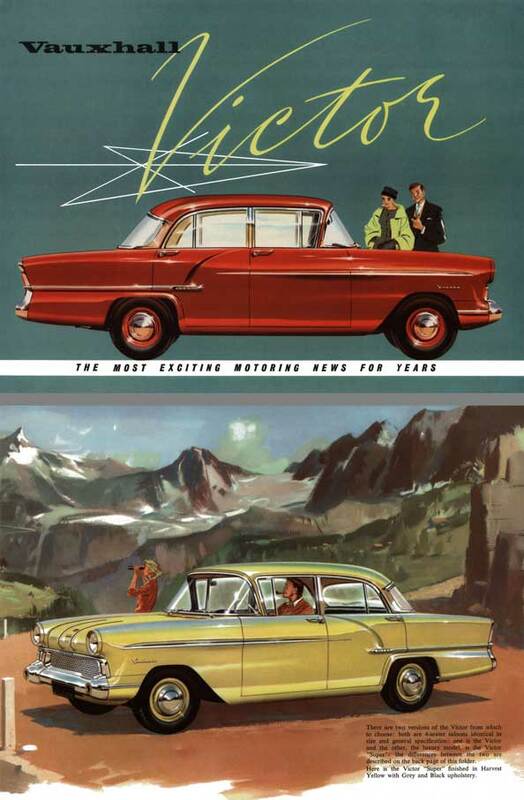 The sturdy sedans sold well, through Pontiac-Buick dealers. Canadians appreciated the quality construction, the low initial cost and the inexpensive maintenance costs. Because Vauxhall benefited from GM’s vast global resources, getting parts and service was no harder than watching maple leaves fall off the tree during a good October windstorm. When it came time to trade, a used Vauxhall held its value. Consumers approved and sales were good. Vauxhall was popular with drivers in Newfoundland and Labrador. 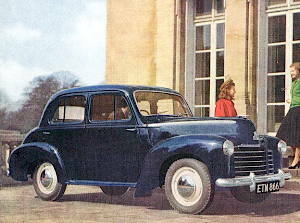 An RHD 1948 Velox is seen here. 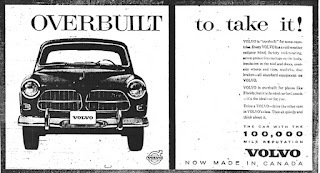 While Ontario was the largest single market for Vauxhall and Quebec its second most popular delivery destination, Vauxhall’s highest market penetration in the 1950s was in Newfoundland and Labrador. Slightly more than 22 percent of all foreign passenger cars registered with the provincial Ministry of Highways and Byways were Vauxhalls. There is an explanation. Newfoundland had been a British colony until March 31, 1949. Folks who bought Vauxhalls prior to Confederation were, of course, making a domestic purchase. They did not pay the high duties applied to vehicles imported from the Dominion of Canada. Vauxhall was a top-ten seller in Canada in 1958. 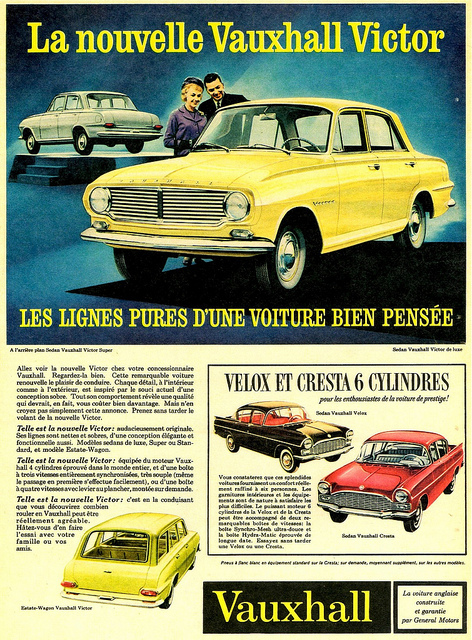 Victors are shown but the larger Velox and Cresta were also offered. 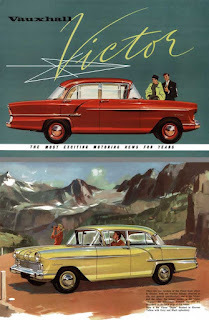 By 1958 the little cars from Luton, England had become the tenth best-selling passenger cars in the Dominion of Canada, snapping hard at the heels of Buick and staying ahead of British Fords. 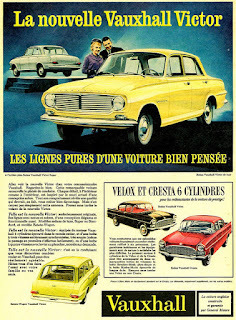 Sales simply exploded for Vauxhall in 1959 as the Victor, Velox and Cresta models reached 32,419 units delivered. 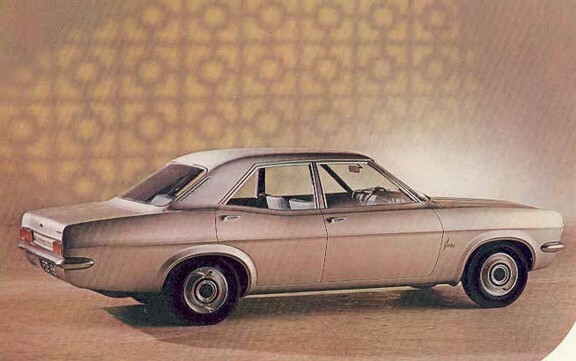 That astonishing sales total pushed it upward to be the fifth most popular car sold in the Dominion, following Chevrolet, Pontiac, Ford and Meteor. Vauxhall outsold Volkswagen by a whisker, topping the West German wonder by 358 units in 1959. The 1960 Envoy was a badge-engineered Vauxhall exclusive to the Canadian market. Since there could never be too much of a good thing, a Canada-only Vauxhall clone, badged as Envoy, was prepared and offered through Chev-Olds dealers for the1960 selling season. 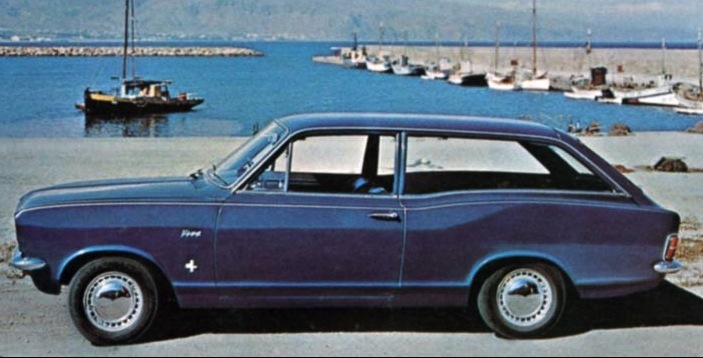 The Envoy and Epic have their own story, though suffice to say that Vauxhall and the instantly popular Envoy alone accounted for 27 percent of all automobiles imported into this country in 1960. The 1962 Vauxhall line was popular with Quebeckers. 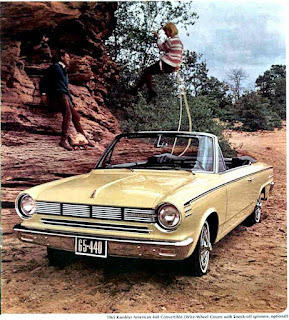 With heat from domestic compacts such as Rambler, Studebaker’s Lark, the Ford Falcon, the Frontenac, the Valiant and Chevrolet’s rear-engined Corvair, Vauxhall sales cooled considerably. By 1963 Vauxhall had slid to the 24th spot, resting between Cadillac and a new domestic entry, Volvo. 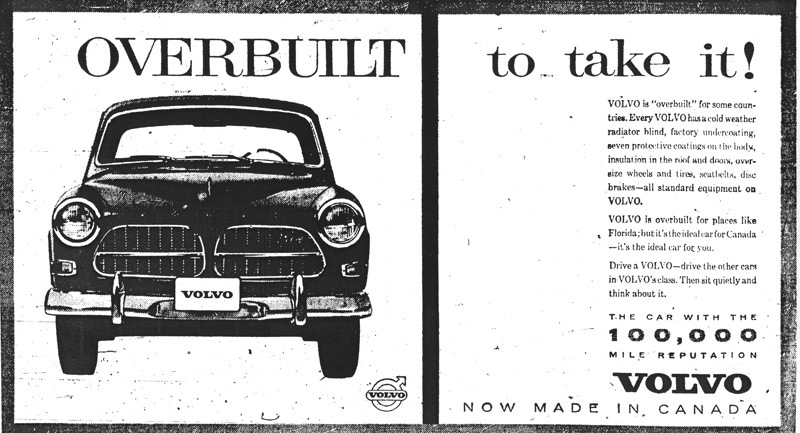 The 1963 Volvo Canadian was assembled in Dartmouth, Nova Scotia. This year will be the low point for Vauxhall. Sales were off substantially because Parliament, concerned about the vast number of imports and the health of the domestic auto industry, passed a bill in the House of Commons to collect taxes on cars from Britain. Vehicles from the UK and other Commonwealth countries had previously entered Canada free of duty. 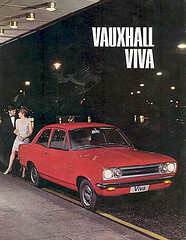 Taxes or not, the super economical, subcompact Viva was introduced and Vauxhall’s popularity with consumers rose appreciably. The 1965 Rambler American was assembled in Brampton, Ontario. With 8,758 sales in 1965, Vauxhall was good for the 23rd spot behind the Rambler American and just a hair’s breadth ahead of Oldsmobile’s compact F-85. Sales tumbled in 1966 as only 6,850 units sold. Vauxhall claimed 34th spot behind GM's Acadian and just ahead of Austin. 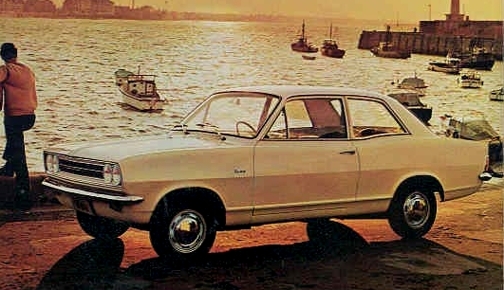 The Vauxhall Viva was given a new body style for the 1967 season. 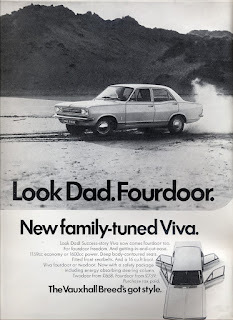 Sales slid again for a third year in a row to 5,789 units in 1967, despite a complete new look for Viva. 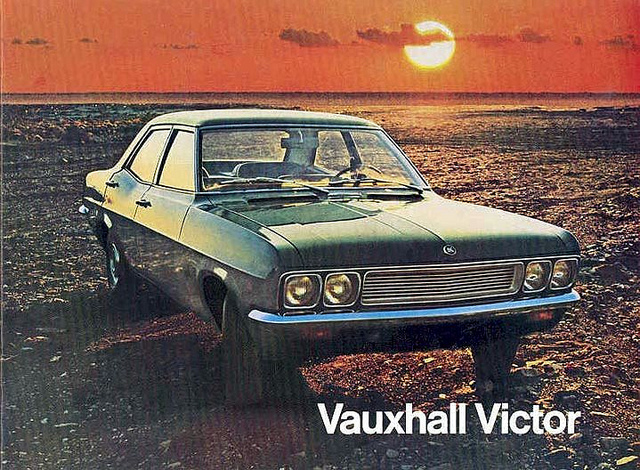 Vauxhall laid claim to the 35th spot in the domestic sales pie, trailing Mercury Comet but ahead of Renault. It must have been a late decision to import the beautiful new Victor that appeared on Vauxhall-Pontiac showroom floors for 1968. Advertising was nothing more than a single sheet, colour on the front with black and white print on the flip side. 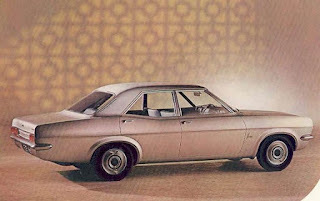 Dated January 1968, it is possible that only few sales were expected from the compact, as Canadians had grown very choosy about their imports. Foreign cars fell into two categories: very small or very fast. The classy Victor was neither, but it was prestigious. Track and Traffic listed the price for the elegant four-door sedan at $2,332 and the four-door Estate Wagon at $2,552. Low, clean and refreshing, advertising hailed the updated look as “uncluttered.” A deeply recessed, subtly V-eed, single Venturi grille carried fine horizontal ribs. Recessed, dual headlights flanked the grille. The Vauxhall griffin adorned the centre of the hood, enshrined in a round medallion. 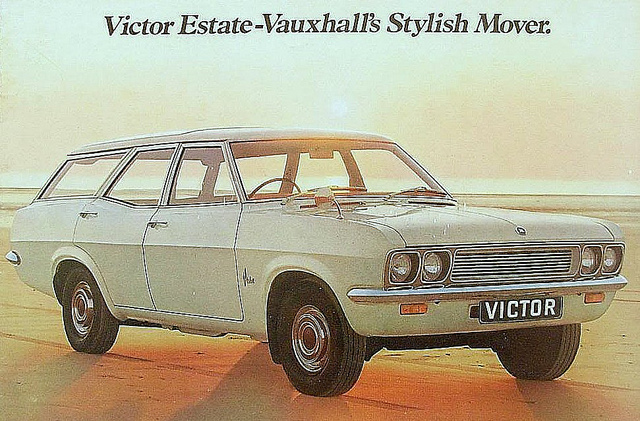 Weighing in at 1 042.7 kilos (2,321 pounds) when it bowed in 1968, Vauxhall’s Victor was cleanly styled. This one, used in early publicity photos, does not carry the new illuminated side markers required by Ottawa that year. From the side, Victor’s envelope was one of gentle curves, culminating in a classic coke-bottle swell at the rear quarter panel. The long hood, short deck theme was a perfect fit. A strikingly pronounced, straight-line crease gave relief to the body above sharply emphasized wheelwells. The roofline was slim though the C posts were a stylishly raked landau type and pitched sharply into the trunk. Vent windows were eliminated. A formal, squarish rear held long, horizontal taillights, set into the ends of a recessed, rectangular cove in which the word “Vauxhall” was spelled out in sizable chrome letters. The bumper made a stylish accent beneath the cove. 1 052.7 The four-door station Vauxhall Victor station wagon was sold to Canadians. A RHD model is seen here. Owners could order the 1600-cc engine with its respectable 83 horsepower under the hood or the hotted up 2000-cc variant of the four-cylinder, overhead cam mill with a mean 120 horsepower rating. With the latter, dubbed as the 474 option, one could also order a three-speed automatic transmission, though an extra-cost, four-speed, floor mounted manual shifter was also available. 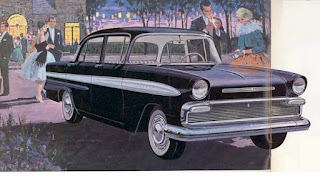 Victor owners were promised “sedan riding comfort with sports-car-like handling.” To back up that fact, the car sported rack and pinion steering and a computer designed suspension claimed to have eliminated a full 20 percent of pitch and roll. The entire package rode on 6.90x13 four-ply, low-profile tires, mounted on wide rims. Advertising skimped on details (how much information can one squeeze onto a single page?) but did promise luxurious interiors that were well appointed. If one ordered bucket seats, they not only got them up front, “bucket-styled” rear seats were fitted into the cabin as well. Other than the new air ducts at the extreme ends, the instrument panel was virtually blank, giving the cabin a very classy look. All the dials and gauges were pulled together in front of the driver in a tight package, capped off under a neat little hood. In contrast to big brother Victor, Viva was given a full colour fold-out and fold-down catalogue. New last year, the pint-sized, two-door subcompact was adorably chubby on its short, 24330 millimetre (95.8-inch) wheelbase. If the base model didn’t please at $1,900 and the Deluxe model wasn’t quite enough, a swanky SL package was available for the tiny Viva at $2,003. The new Viva station wagon’s load dimensions were 152 centimetres (59.9 inches) in length, 83.2 centimetres (33 inches) between wheel arches and had a load height of 79.2 centimetres (31.2 inches). It held .52 cubic metres (18.6 cubic feet) of cargo with the back seat in the upright position. A new model--an Estate wagon--bowed with a list price of $2,100. The two-door wagon was truly a unique Canada-only creature; it was never offered in any other market, not even in the UK. 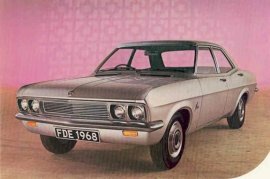 A total of 9,357 Vauxhalls sold in 1968, giving it 26th place in the domestic market, behind the Ford Cortina and ahead of the Chevrolet Nova.